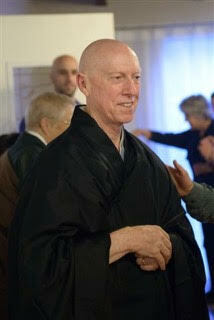 Lay ordained by Reb Anderson, FukuDen John Briggs was a regular practitioner at No Abode, Green Gulch Farm, Valley Streams Zen Sangha in Sacramento, and a resident at Tassajara in fall 2006 and 2010. John was priest ordained by Edward Brown in 2012 and served as Head Student at Clear Water Zendo in 2015. John was introduced to Buddhism rather late in life and was devoted to sitting and the Bodhisattva way. He faced his illness with grace and courage. A cremation ceremony attended by family and close friends was held on October 13, officiated by Rev. Mary Mocine of Clear Water Zendo. There will be a memorial service on Sunday, December 4, 2 – 4 pm at Sacramento Dharma Center, 3111 Wissemann Drive, Sacramento, CA 95826.